Kids can safely jump and have fun in the comfort of their own backyard with Bounce Pro’s 14-foot Trampoline with Steelflex Enclosure! This 14-foot trampoline makes a great addition to any backyard and was created with quality and safety as top priorities. This product features a heavy-duty rust-resistant galvanized steel frame that offers a strong product construction. The frame is supported by U-shaped legs and patented double welded plate leg welds at the joints for added stability and safety. 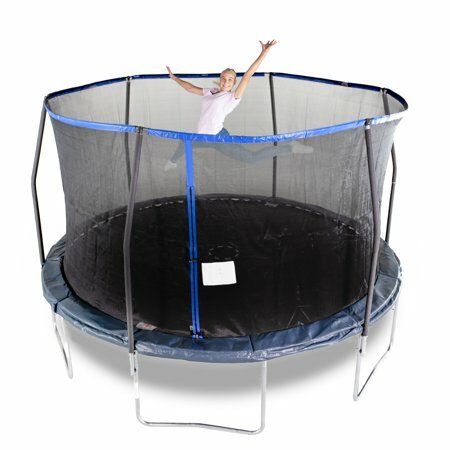 The patented Steelflex enclosure ring strengthens the netting enclosure by preventing net sagging so kids can safely jump in the trampoline. The TenCate Permatron jump mat is treated to be UV resistant to ensure product longevity and is reinforced with premium stitching that provide stronger and longer-lasting attachment to the springs. It’s fun to have fun and be safe while jumping on the Bounce Pro 14-foot Trampoline with Steelflex Enclosure!All Bounce Pro products meet or exceed all ASTM safety standards, so parents can be sure their kids are safely having fun.